A regular round-up of what others are saying about the modernisation of health and care. 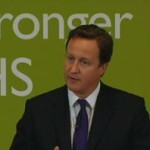 Prime Minister David Cameron has delivered a speech at Ealing hospital setting out the case for change in the NHS. Read the Prime Minister’s speech in full on the Number 10 website. Question: What do healthcare professionals think about the modernisation of the NHS? A number of stories in the media this week are looking ahead to the special meeting of the BMA’s representative body to discuss the planned changes to the NHS, and the possible reaction of healthcare professionals. A DH spokesman said: … Read more → – Question: What do healthcare professionals think about the modernisation of the NHS?